The year is 1898 and the only valuable piece of real estate to conquer in the name of Queen Victoria and the mighty British Empire is the moon. So it has fallen upon you, the League of Adventure, to put down your cup of tea and build a rocket to the moon. 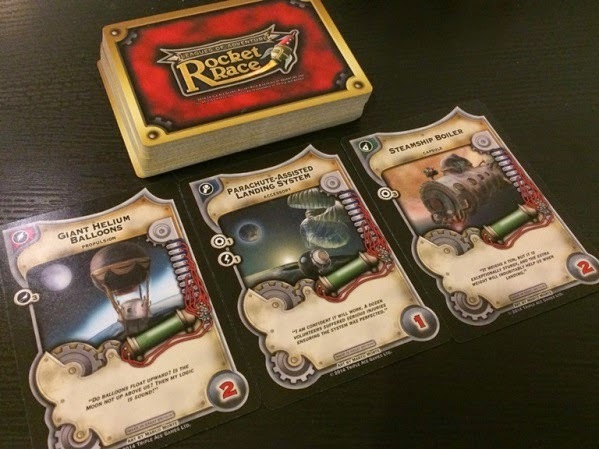 Rocket Race is a card game form Triple Ace Games where the aim of the game is to build the first rocket to the moon, the Queen herself that wave the chequered flag. Each rocket needs at least three components; a habitation pod, a propulsion system and a steering mechanics. But it’s none of this titanium hulls and computer aided geo-satellites for you, no its diving bells, anti-gravity paint and a team of mice to build up your rocket (because mice will instinctively navigate to the nearest sauce of cheese, of course). You can also pimp out your rocket with add on such as Cushionomatic Impact Reducers, Artificial Nutrition Pills or a Clockwork Autopilot. Each one of these zany components has a reliability, to fly to the moon you simply have to be able to roll under your total reliability for your rocket on two dice. Easy. 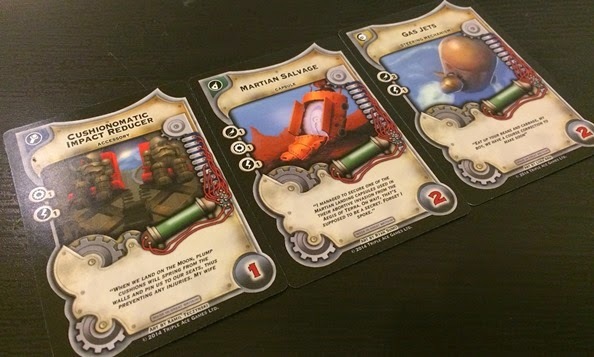 Obtaining these components is where the game gets interesting and in fact Rocket Race can be played in two different ways. The first method is a bidding game, and this is the version suitable for more players and my personal favourite. You have 10 resources available, think of them, as your team of scientist and engineers, and bid on each component as it becomes available. Components with high reliability or that missing part of the ship are going to be most important to you, so you’re going to end up benefitting more than everyone else. Unfortunately the more you pay for a component the longer your gentlemen engineers are locked into developing the actually thing, all of the resources spent are locked up into the component and released at a dripping rate of one per turn. Not only does this lock up your resources, meaning you can’t bid as much in the next round, but it also means you can’t immediately get your rocket off the ground. This bidding mechanics may be similar to other games but it works so damn well, and with more players and therefore a scarcity of the core components this bidding can also get very fierce. The more you pay the longer it takes you to get your ship off the ground which means that players can force you to spend high just to keep your engineers busy. It really is dynamic and very tactical. The second version of the game is more complicated, but in my opinion less fun. Here you manage your resource in chemistry, engineering and electronics. Each component has a specific resource cost and you have to invest in these research departments to pay for components available. In this mode you also take on the role of a specific League of Adventure, who have different skills and have different odds of gaining a scientific breakthrough. There are some player dynamics as there’s nothing stopping you from buying up the parts your opponents need in order to slow them down but I don’t feel this version of the game has as much player interaction. Have I ever mentioned how much I don’t like optional rules? Well Rocket Race has optional rules regarding launching of the rocket, in standard rules it’s a simple case of rolling two six sided dice and scoring equal to or under the total reliability score of the rocket. If you do this you’ve won the game and sometimes a lucky roll means a barely held together ship gets to the moon and wins the game and the whole thing is a bit anti-climactic. However there are optional rules for a three stage soiree to the moon: launching, travelling and landing. A player has to pass all three reliability rolls on three consecutive turns to be declared the winner. It makes the game much more tense and much more fun as now there are three times as many chances of a rocket crashing and burning, which is always fun as long as it isn’t happening to your rocket. Triple Ace Games are more known for roleplaying games than board and card games. Not only is this a damn strong opening form them but you can’t help but feel that Rocket Race was designed to fit in-between RPG game sessions. Even with all the knobs pulled out and this game at its most complicated; you’re still looking at a twenty minute game. Rocket Race is silly, and in my opinion, enormous fun. 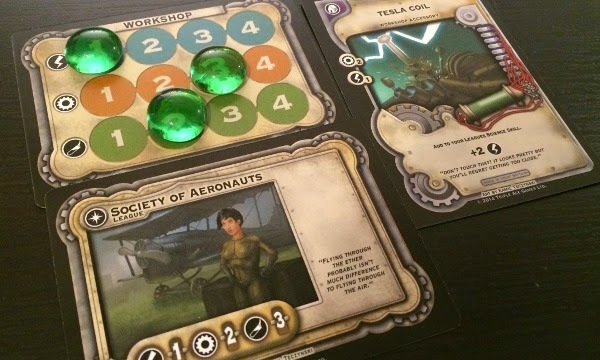 I’ve got to admit that I much prefer the bidding version of the game as it really ups the competitive play ante, and you’ve never hated someone so much when they’re trying to out-bid you on anti-gravity paint when they have perfectly good helium balloons in their workshop. The advanced version of the game is perfectly suitable, especially for those who might get offended with such direct competition. It’s a quick and light game that aimed for the moon in terms of fun and entertainment and wins on both counts. To give you an idea of how much I enjoy this game, I played a demo at this year’s UK Games Expo and immediately bought a copy! Rocket Race is a quick and silly game that crams a huge amount of competition into a tiny box.